<Background> Japan’s 2010 guideline recommends D3 lymph node dissection for T3 or T4 colon cancer. D3 in right-sided colon cancers requires not only mesocolon lymph node resection but also main node removal along the so-called surgical trunk. 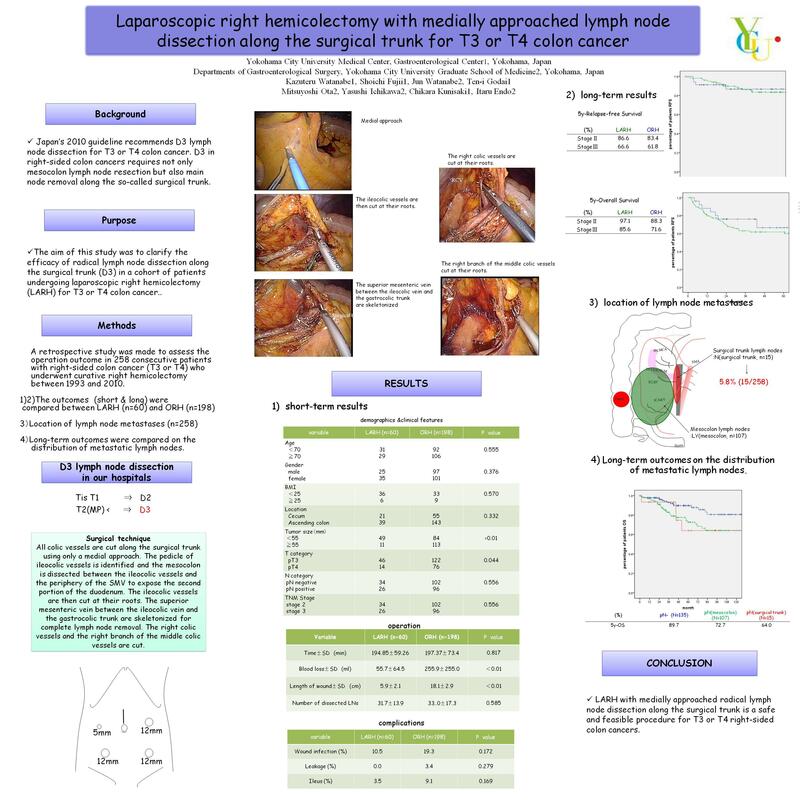 The aim of this study was to clarify the efficacy of radical lymph node dissection along the surgical trunk (D3) in a cohort of patients undergoing laparoscopic right hemicolectomy for T3 or T4 colon cancer. <Methods> We enrolled 258 consecutive patients with right-sided colon cancer (T3 or T4) who underwent potentially curative right hemicolectomy between June 1993 and December 2008. Patients were divided into two groups: laparoscopic-assisted right hemicolectomy (LARH) group (n=60) and open right hemicolectomy (ORH) group (n=198). For all patients, patient and tumor characteristics, perioperative findings and long-term results were extracted from the case records retrospectively. <Surgical technique>All colic vessels are cut along the surgical trunk using only a medial approach. The pedicle of ileocolic vessels is identified and the mesocolon is dissected between the ileocolic vessels and the periphery of the SMV to expose the second portion of the duodenum. The ileocolic vessels are then cut at their roots. The superior mesenteric vein between the ileocolic vein and the gastrocolic trunk are skeletonized for complete lymph node removal. The right colic vessels and the right branch of the middle colic vessels are cut. <Results> The demographic data of the two groups were similar. The mean number of total lymph node harvested and lymph node along the surgical trunk did not differ significantly between the two groups (31.7/4.4 vs. 33.0/4.6). Operation time was similar. The LHRH group had a lower volume of intra-operative bleeding (55.7 vs. 255.9, p<0.01) and a shorter post operative hospital stay (9.6 vs. 15.8, p<0.01). There was no significant difference in operative complications; wound infection (9.8% vs. 19.2%), anastomotic leakage (0% vs. 3.5%), ileus (3.5% vs. 8.9%). Relapse-free survival (TNM stage2:83.4,3:62.5 vs.2:81.7,3:64.4) and overall survival (TNMStage2:96.5,3:88.2, vs.2:88.2,3:69.3) did not differ between two groups. <Conclusion>LARH with medially approached radical lymph node dissection along the surgical trunk is a safe and feasible procedure for T3 or T4 right-sided colon cancers.